Senate Republicans' tax reform bill has the votes to pass. 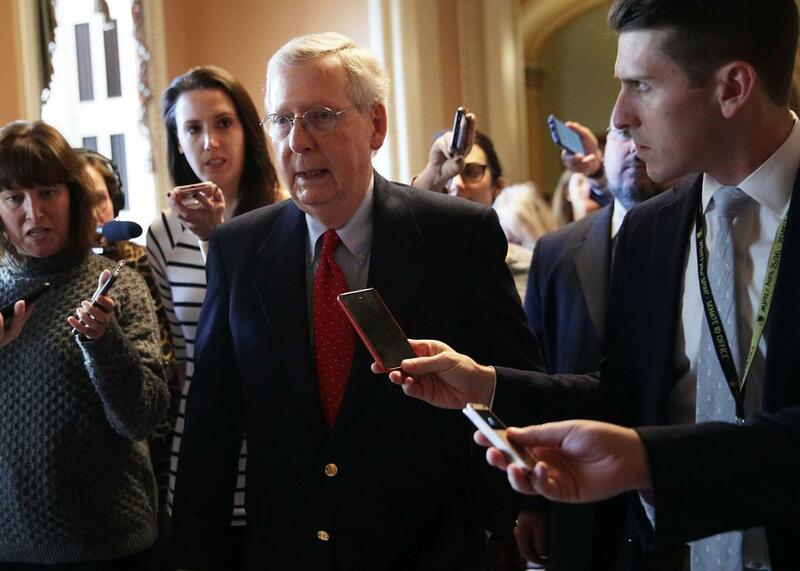 Senate Republicans have the votes to pass their tax bill, Senate Majority Leader Mitch McConnell told reporters late Friday morning after meeting with his caucus. The GOP senators were all smiles on the Senate floor afterwards—except for Tennessee Sen. Bob Corker, who appears to have gotten rolled. The holdouts heading into Friday morning were Corker, Arizona Sen. Jeff Flake, Maine Sen. Susan Collins, and Wisconsin Sen. Ron Johnson. Johnson announced his support for the bill earlier in the day. The deduction for pass-through businesses, which the original bill pinned at 17.4 percent, will now be 23 percent. He told reporters the cost would be offset by adopting the House’s slightly higher rates on deemed repatriated earnings. Collins seemed quite pleased leaving the caucus meeting, and said to expect a statement soon, as a McConnell staffer ushered her through the sea of reporters. Collins had been calling for a couple of health care provisions to pass separately, to mitigate the negative impact of repealing Obamacare’s individual mandate, as well as to include the House bill’s deduction for property taxes. Her reaction suggested perhaps leaders had persuaded Collins to take them to 50 votes, allowing them to ignore the demands of deficit hawks like Flake and Corker. Corker had thrown the process for a loop on Thursday night, holding a procedural vote hostage until he got a commitment for an additional $350 billion in revenue. That didn’t go over well with the rest of the conference, and Texas Sen. Ted Cruz led a counter-revolt. A reporter asked Cruz on Friday morning if he won out. Marc Short, the White House’s legislative director, was making the rounds Friday morning. I asked him if the plan was just to leave Flake and Corker behind without major changes on their issues, and to just get to 50 with Collins. “No, I would not say that,” he said. We found out why shortly thereafter, when Flake announced his support. We’ll find out soon enough how far that “firm commitment” gets through the legislative process. But for now, he’s on the bill. Getting 51 votes instead of 50 is important for leaders not just as a show of strength, or to give tie-breaking Vice President Mike Pence his Friday duties off. It also would make the final vote on the conference committee report “Alabama-proof,” in case Democrat Doug Jones wins the Dec. 12 special election against Roy Moore. Another piece of outstanding business, the Rubio-Lee amendment to boost the child tax credit and raise the corporate tax rate, will still come up for a vote as an amendment, Lee’s office told me. Corker may or may not vote for the bill. But he, and the deficit hawk cause, got taken to the woodshed overnight. Corker is usually quite chatty with reporters. He wasn’t after the meeting Friday. “I’m not in a conversing mood right now,” he said.